This year we're going to work toward reducing our lunch waste -- plastic utensils, plastic bags, juice boxes. The boys have agreed to use these handy lunch kits; Mia wants something a little more fashionable. I can't comment on the quality of usefulness of the kit yet, as I just ordered them. They seem a little spendy until you start adding up the cost of all the individual accessories from other companies. I also found a 10% off coupon code online, and those always help a little. So once we try them out, I'll let you know if we are actually able to give up Glad bags. I applaud you for doing this. 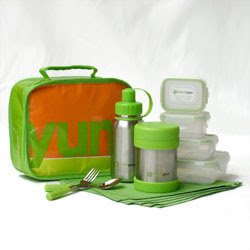 Unfortunately, as my kids are getting older, they seem to dislike lunchboxes -- somehow they're just NOT COOL! Aaaarg---right now they seem to think paperbags are the "environmentally" friendly solution... I think the 6th grader might go back to lunchboxes, esp since we got her a really good-quality Stanley thermos for bringing hot foods, but the High-schooler would rather die than be seen with one of those!!!! Don't you just hate peer pressure?!?! Notice that I said my 6th grader wanted something more stylish too!! !